* Take advantage of our Bulk Buy discounts and purchase The Wireless Poker Controller for your Poker Team or group of friends! Order a 10 Unit Bundle today and get a fantastic saving on each item!!! The Wireless Poker Controller™ is a NEW Revolutionary & Exclusive Product designed to make Online Poker more enjoyable and much easier to control! The handheld Wireless Poker Controller is easy to use and helps poker players to make more accurate moves in a fast & comfortable manner. The Wireless Poker Controller™ can assist players of any level, beginners and pros alike can learn to increase their bet speed & accuracy, avoid errors and play more accurately and efficiently. The Poker Controller™ even features an emergency 'TILT' switch which can be programmed by the player to automatically lock them out for a cool-off period after a bad beat or losing session. You can play in either Wired or Wireless Mode and Play in all your favourite Poker Rooms and the Wireless Poker Controller is currently compatible with the following Online Poker Rooms: Pokerstars, FullTilt Poker, Party Poker, Ultimate Bet Poker, Pacific Poker (888), Cake Poker, Ladbrokes Poker, Absolute Poker, Everest Poker & Titan Poker. More Poker Rooms and updates and additional features are being added to the software all the time and you will receive automatic and FREE updates to your software for the lifetime of your Poker Controller. All in all, more control, much more comfort and more time to enjoy the game you love to play! 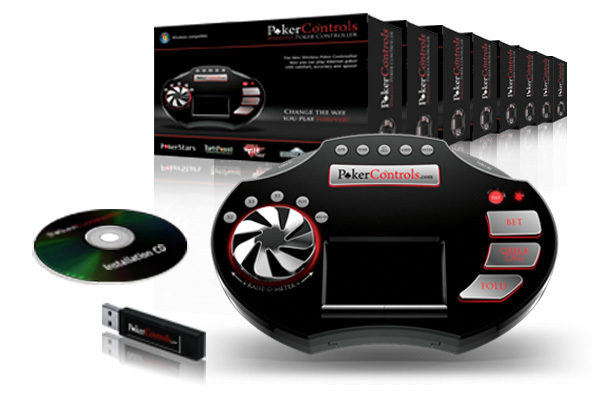 Click the button below to add the Wireless Poker Controller - 10 x Bundle Pack to your wish list.